Siberia is rather low in linguistic diversity compared to areas like Nepal, but this is in part a reflection of population density. 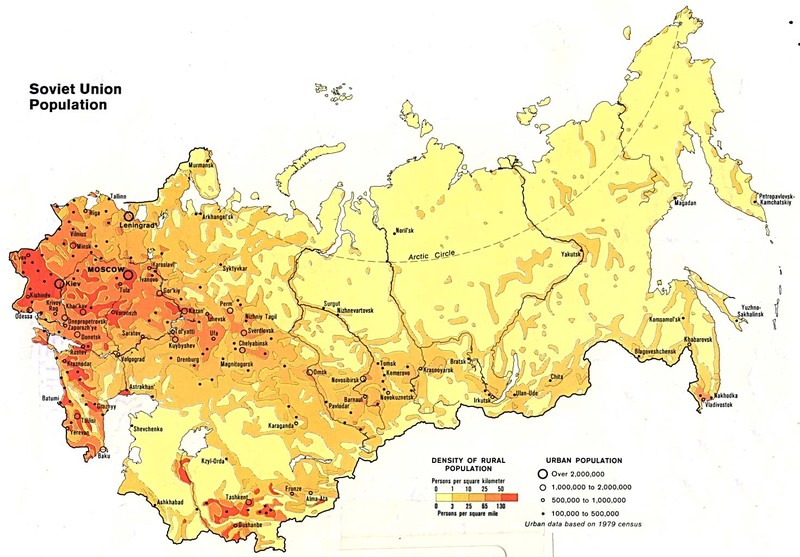 Map of soviet population density showing that Siberia is low in population density. The name, when looked at from the perspective of comparative linguistics gives the general impression of “pure people”, the noble savage, symbolizes unspoiled nature. He is played by the actor Maksim Muzuk, a Tyva (Turkic) “ethnic,” not someone of the specific group being portrayed. The character uses curses, spells and shamanism. For the film makers, the actor just has to be “ethnic”, not of the correct group. Early in the movie, his costuming associates with shamanism, this also plays out with subplot with animals (killing the tiger in particular). Siberia in the imagination of many Russians was actually like this, fictional rendering is educational about the way in which Russians encounter Siberia. Russia—a lot of people value what the Soviets did for education, the system was valued positively so language is a positive. Double edged sword, contributes to disappearance of language.